The much anticipated three-year schedule on how Diageo will sharpen United Spirits’ operations, along with that of its own brands, is coming through. The newly constituted board of directors at USL is understood to have given the go-ahead for focus on a 14 power brands strategy, drawing from USL and Diageo’s brands in India. This is a far cry from a portfolio which spanned 140 brands which USL straddled, prior to Diageo coming on board as a majority 54 per cent stake holder, after paying Rs 18,500 crore (Rs 185 billion). According to various senior UB Group officials, the strategy of 14 power brands’ focus is expected to be rolled out soon. 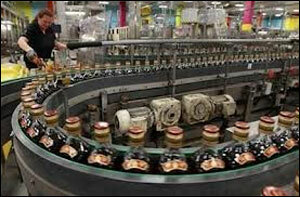 It will be presented to Diageo's global executive committee, expected to meet in India at the end of this month. It appears the revamped focus is expected to draw on the three main brands of Diageo -- Johnnie Walker, VAT 69 and Smirnoff, besides the known USL whisky, rum, brandy and vodka variants from the McDowell No 1 family, Royal Challenge, Antiquity, Bagpiper, Director’s Special Whisky and Black Dog scotch whisky, among others (see list). This is part of Diageo’s spelt out strategy that they will drive the premiumisation agenda at USL, which has itself been at this for five-odd years. The Prestige and above segment has been growing at 21 per cent during the past year. “Though USL has as much as a dozen key umbrella brands, there are 140 trademarks for various of those brands which encompass the family of spirits across USL operations. "Over the next three years, Diageo-USL will add intense focus on the 14-power brands,” a senior UB Group official told Business Standard. Seniors further said this overhaul was the first major step which the Diageo-led USL is being put through after USL took over as a sales agent for Diageo brands in India. According to IWSR, a global research organisation on the spirits markets, the largest-growing global brands on the Real 100 list are Indian whisky brands, including McDowell’s, showing India’s growing thirst for Western-style spirits. Diageo’s acquisition of a controlling shareholding in USL means the combined entity has 18 brands (nine each) on the global top 100 list. Last year’s seventh-placed brand, McDowell’s, posted growth of four million cases, moving the brand to sixth place. Johnnie Walker is one of nine Diageo brands on the Real 100 list, equalling USL’s nine brands, which include Celebration rum and McDowell’s. Johnnie Walker, the largest Scotch whisky, was also helped by healthy growth in India and South Africa. It moved two places up the ranking to number eight, closely followed by Celebration rum of USL, which also jumped up two places, according to IWSR.